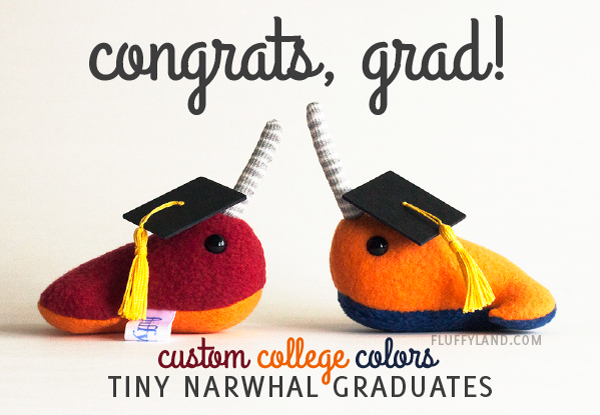 I’ve been playing with fleece swatches and tiny stitches for weeks, and I’m finally ready to announce: tiny graduate narwhals in custom college colors! These are so fun to make. The bright colors bring the tiny narwhals to a new level: each pairing of hues gives the little guys an entirely unique personality. I started with my home state, Virginia, with Virginia Tech facing off UVA in the banner photo. But who’s next? I can’t wait to make these in every shade of the rainbow. The graduation narwhals make a great gift for college grads, of course, but I think they might be even better suited for high school graduates who can spend the summer scheming and dreaming with a college-colored narwhal by their side. They probably already have enough t-shirts from their future alma mater – and if they don’t, they’ll get more for free when fall comes. What they don’t have is a tiny narwhal with a graduation cap.